This exhibition shows 8 works, focusing on unpublished new works produced from 2010 to 2011. The new work named “It stole your thunder - Alchemy Box #25”, is a cardboard box associated with the packaging of paintings in Japanese culture. A painting named “It stole my thunder” on a thick panel replicating such a cardboard box is located diagonally to it. This installation is questioning the definition of 2D and 3D in art. 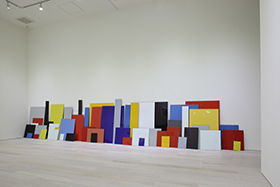 In addition, an installation new work whose motif is the works of famous color field painters in art history is from the same series of works currently exhibited at Venice Biennale. 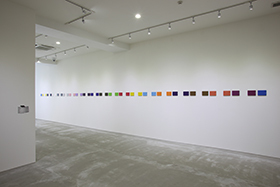 The colors selected from renowned works are reorganized by cheap clip-frames so that the piece requires viewers to consider if the symbolized colors exhibition in question represents the continuance of art history or not.